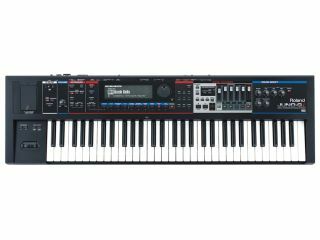 PRESS RELEASE: Roland announces the JUNO-Gi Mobile Synthesizer with Digital Recorder. The JUNO-Gi is compact, easy to use, and affordable and also boasts an all-new sound set designed for live performance, built-in eight-track digital recorder with 64 virtual tracks, and easy integration with many digital audio workstations through its built-in audio interface. The JUNO-Gi runs on AC power or batteries, so users can play music anywhere. On board are over 1,300 brand-new, top-quality sounds optimised for live gigs. Sounds are organised into Live Sets, allowing four-way splits and layers with ease. Tone Category buttons make it simple to navigate the massive sound library, while the powerful mood, pitch bend, and D BEAM controllers let players add expression to sounds as they perform. The JUNO-Gi also includes a built-in eight-track digital recorder for song production, complete with transport controls, mix faders, and a dedicated rhythm machine track. Record directly to a single high-capacity SD card for up to 192 hours of possible recording time with a single 32 GB card. JUNO-Gi sounds can be recorded easily along with a vocal mic or guitar when connected via the rear-panel XLR microphone, guitar, and line level inputs. Powerful dedicated effects processing is available for live recording, mixing, and mastering, including BOSS GT-Series professional guitar effects and effects designed for vocal processing. The JUNO-Gi also functions as a USB audio/MIDI interface, making it the perfect companion for computer music production. Users can record JUNO-Gi sounds and play software instruments in any DAW, and also record vocals and guitars while using the JUNO-Gi's onboard effects. In addition, the JUNO-Gi comes bundled with Cakewalk's award-winning SONAR 8.5 LE software, giving users a complete DAW solution for their PC.